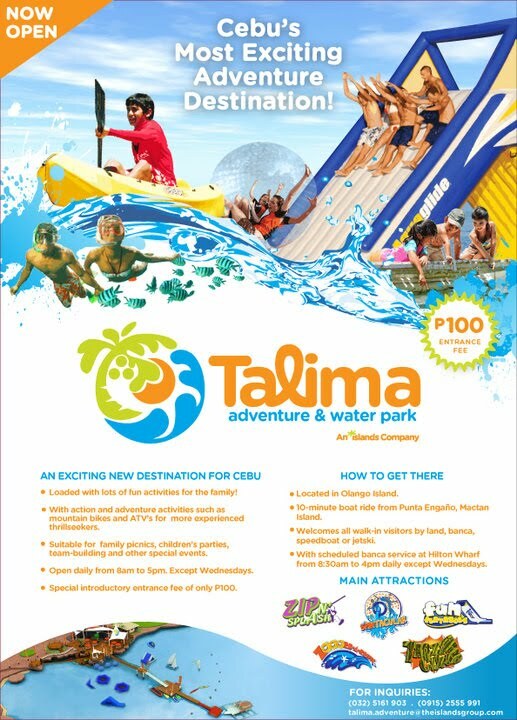 The Talima Adventure Water Park, a water park at Talima, an island off Mactan, Cebu, opened last May 22, 2010. It's a waterpark with life size inflatables much like the ones set up in Lago del Rey, Camarines Sur but at a smaller scale. Cebuano's really has the knack (including me) for trying new places. So I pooled by friends and family one Sunday. Aboard a rented outrigger boat, we left Queensland Wharf and got to Talima 30 minutes later. Unfortunately, we (along with so many other boats) were denied entry since they were too full. We ended up island hopping in the waters of Mactan. After having been to many other places, it makes me appreciate the waters of Mactan. I'm lucky to have access to white sandy beach 30 minutes from where I live. The rest of the day was spent jet skiing! Oh boy, it has been many years since the last one. When we were younger, we would beg to rent it for just 30 minutes, and share the time among us siblings. Jet skiing is an expensive sport, renting one costs about P3500/hour. Thanks to my friend JJ and her brother, who lent us the unlimited use of the jet ski! We went skiing circling the islands of Mactan together with the kids. It excited them as well, fortunately, the sea was calm in the morning. Option 1: Rent a private boat from any resort/outrigger boatman in the shores of Mactan, Island, a medium sized boat with capacity of 15 pax costs about P2500-3000, while bigger ones with capacity of 30 pax costs P3000-4500; this can be used the whole day. Option 2: Take a common boat by Islands Banca Cruises at the Hilton Wharf (after Hilton Hotel) for P50/pax one way. Daily trip schedule (except Wednesdays) is as follows: 8:30 am, 10 am, and 12 noon. The last returning boat from the park to the Hilton wharf is at 4 pm. Option 3: Take a public outrigger boat for P16 to Sta. Rosa, Olango Wharf at the Hilton Port. Upon reaching the Olango Wharf, you may need to ride a trike going to Talima Adventure Water Park. Warning: Timing of the tide is crucial since the inflatables are a few meters from the shore, thus it will be closed during low tide. Zip n splash is likewise not allowed during low tide. Bringing of food is not allowed. There are a few restaurants and food kiosks like Cheaverz inside the park. The prices are similar to that in the city (or so they say), but lechon is sold at a hefty price of P600/kilogram. nyek! it just opened, right? and yet closed already? i heard the park reopened last Saturday (june 19). yeah, it just opened then was closed temporarily. bad trip nga eh, we had a company outing scheduled there but was not informed of the closure; so they had to go some other place. IMHO, it's not a good idea to go there now, medyo magulo pa systema nila. Although if you insist, i suggest you go there as early as 6 or 7 in the morning to get in.